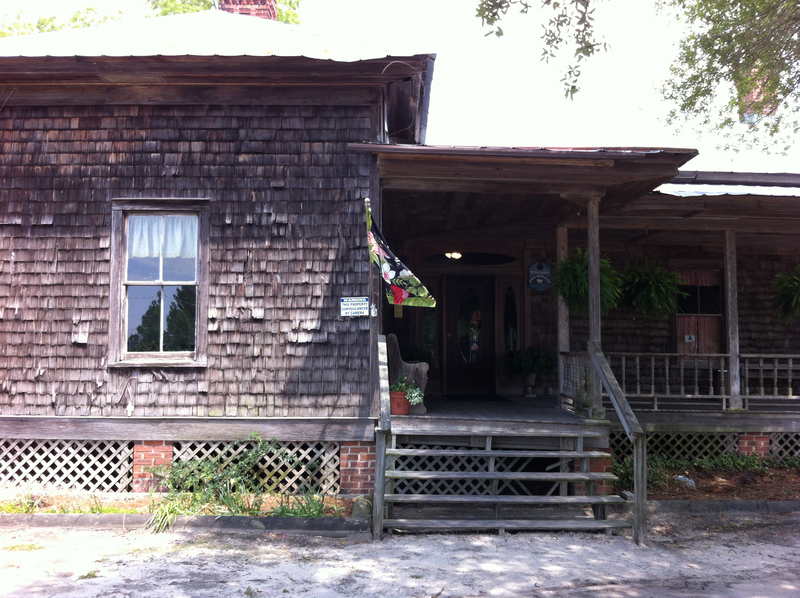 Sweatman’s Barbecue – S.C. 453, Eutawville, S.C. No phone. It’s not easy to reach, way out in the fields beyond Holly Hill, S.C. But it’s worth the trip for excellent South Carolina barbecue. A trip through the buffet line (first-timers can go through twice) gets outside-brown chopped pork mixed with mustard sauce, tender meat from closer to the bone, terrific ribs covered with sauce, hash over rice, and even crispy pork skin. It’s only open Fridays and Saturdays, and it closes for four weeks between July and August. 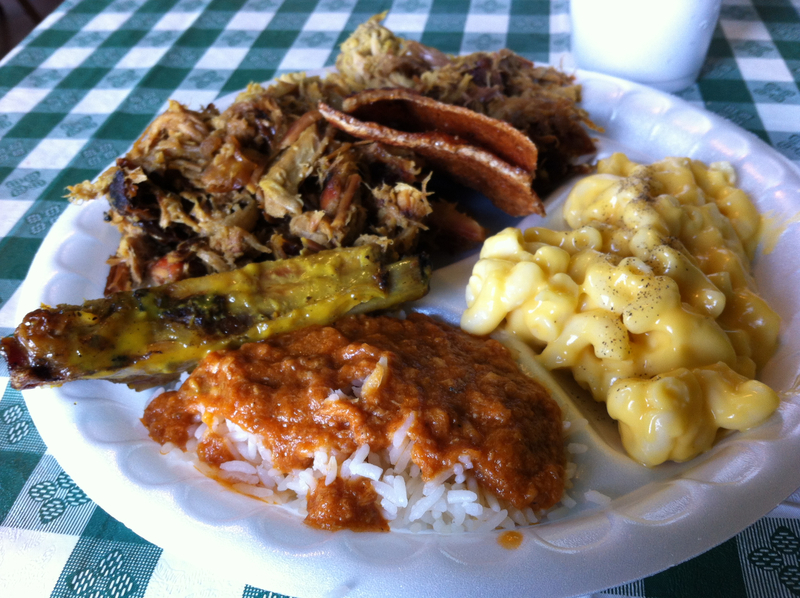 This could be the redemptive barbecue strike for the whiff at Jackie Hite’s in Batesburg-Leesburg, SC, on the way up. We drove about twenty miles out of the way to find that they weren’t open for lunch…. Eutawville is about 15 miles north of I-26 and half way between Charleston and Columbia. I was psyched – a place with no phone and only open on the weekends? I’m in. As we drive up, the first thing I notice is the fancy sign, with their phone number and URL. Phone number? URL? Uh-oh. I wonder if this means that I’ll only get to go through the line once? It did. As we walked in the front door, the first that I thought was that this was very “intentional-looking” barbecue place. Kind of fake and over the top. Any place where you walk in to the register, instead of to a server automatically makes me think of the Golden Trough. The guy behind the counter asks how many, and then tells me how much it is going to be. Apparently, I have little choice in the matter. There was a single hot table, manned by a cook, to tell us what was there – mac-n-cheese, green beans, barbecue hash, chopped pork, pig skin, ribs and banana pudding. Had I know how good the hash was, I’d have covered the plate in rice, then hash, then chopped pork and my single blessed rib. The rib was good, but not great. The fried pig skin was fairly awful. The pork (inside and less burnt) was okay. But the hash was really good. For those of us who don’t know about barbecue hash, it’s a South Carolina alternative to Brunswick Stew. While the stew would have every vegetables, plus extra meats in a stewpot, the hash had all the pig parts (from ears, through pork and rib-tips, to feet) ground up very fine into a sauce that resembles Coney chili. It was really tasty on the rice. 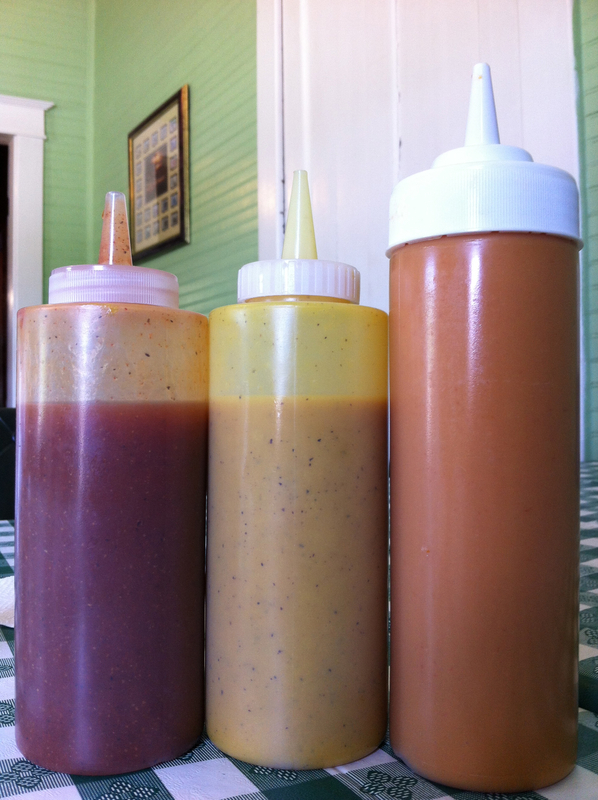 There were three sauces on the table, a sweet, vinegary sauce, a South Carolina mustard sauce and a spicy mustard sauce. I really liked the spicy sauce. 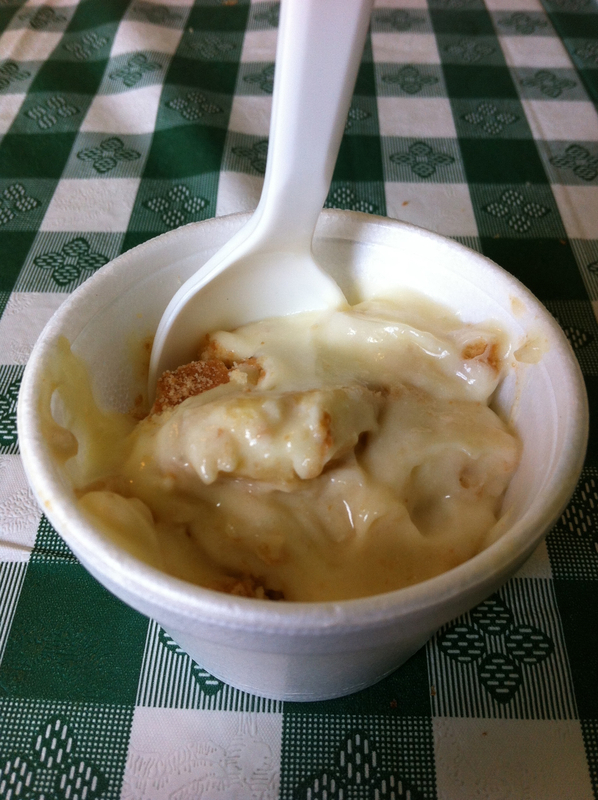 And the banana pudding? Really? It was good, but there was so little that you could barely taste it. After reading some reviews when we got home, and found that there had been a change of hands a couple of years back. I guess I can’t blame my friend for a bad recommendation, as his advice was pre-change-of-hands. Live and learn. It wasn’t awful. It just wasn’t a destination, like I thought it was. 78% sounds about right.